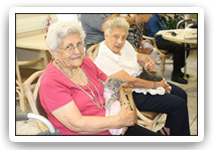 Using Pet therapy provides a fun and friendly way to bring joy into the lives of the elderly and physically infirmed. Farm Visits can accommodate, Nursing Homes, Rehabilitation Centers, Adult Daycares, Special Need facilities, etc. You can be confident that all of our baby animals are very clean and healthy. All the animals have been vet checked and have health certificates, and we are fully insured. I will bring approximately 25 baby animals to ensure that everyone can participate. The babies will included a diapered goats, piglet, lots of bunnies, kittens, chicks, chickens, lamb(when available). We can also accommodate any request for specific animals. Baby blankets will be available to hold the babies and I will be present at all times to ensure safety and cleanliness. All of our baby animals are born and hand raised on my farm. This process ensures that when my babies arrive at your facility they will be healthy, sweet natured and enjoy you as much as you enjoy them. In addition to one hour bookings we offer bi-weekly and monthly programs.